Great significance is often placed upon ET-related utterances from world leaders by those promoting ‘disclosure’ of UFO secrets. The former US President Ronald Reagan was well-known for having what one of his aides called an obsession with “little green men”, including a story about his own sighting from a plane in 1974. At the height of the Cold War he even startled his aides when, at a meeting with Soviet president Gorbachev, he suggested the two super-powers would cooperate if Earth was ever invaded by aliens. 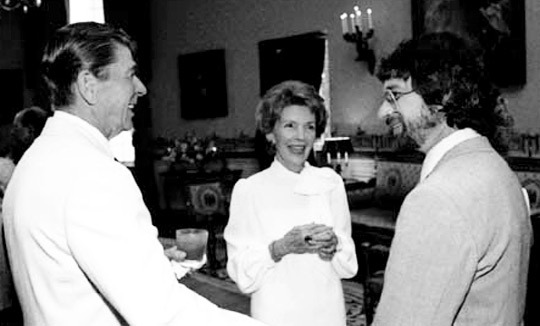 Another persistent rumour was that after a special screening of ET: The Extra Terrestrial at the White House in 1982, Reagan turned to film-maker Steven Spielberg and “started talking about how close to reality it was” before being quickly ushered out of the room. Was Reagan about to spill the beans or was he simply having some fun? But rather than being quickly ushered out, the whole room erupted into laughter. The guests recognised this was a joke and this was confirmed when the President pulled Spielberg aside for a private chat. He recalls: “I don’t think he let something slip there, no…because I’m a bit of a UFOlogist I was hoping there was something more to the joke than met my eye [but] I’m sorry to say I think he was simply trying to tell a joke.” But why let the facts get in the way of a good story? This entry was posted in Uncategorized and tagged ET, ronald reagan, steven spielberg. Bookmark the permalink. 1 Response to Only joking folks! There is simply no question that given the enormous distances to be traveled, that the idea that a manufactured craft carrying biological entities could travel to earth is preposterous. Yet given the size of the universe there is a very good possibility that other advanced civilizations do exist. About one hundred years ago we began transmitting intelligible data mostly in analog form. About twenty years ago large amounts of digital, logarithmic data has been transmitted. Suppose there is an advanced civilization twenty five light years away. After they received enormous amounts of information about us, might they in turn send us information about themselves. Also consider that they perhaps have been in contact with other civilizations thirty or forty light years distal to them, and that civilization was in contact with others even more distal etc etc. Now there is no conceivable way these aliens could visit each other or us, but might they be exchanging data with each other? Could each of those civilizations who are “on line” possess a central source of data about other civilizations which will be given to those capable of receiving it. Perhaps some day an interesting “virus” will invade a computer on earth and wondrous things will be revealed.